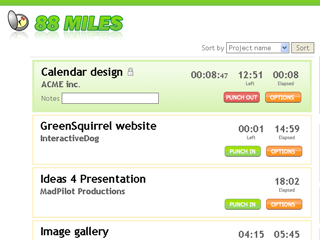 Founded by Myles Eftos, 88 Miles - is a simple time tracking application, aimed at the SME market. 88 Miles was founded and developed by Myles Eftos. I developed this for my freelance and consulting business because I realised that I couldn't accurately account for his time when working for clients. A beta was out with in 2 months - the final version was launched after about 6 months. To provide an sustainable, un-obtrusive time tracking system that will be useful to other small companies. It is time tracking that I would want to use. As a consultant, I don't need all the flashy Gantt charts or reports - I need to be able to track my time quickly and efficiently and generate a timesheet for my clients. This is all88 Miles does and it does it well. Small to medium design and development firms. I'm also looking at the recruitment industry. I'm currently up to 24 paid account totalling 45 users which is breaking even on expenses. I am in the process of ramping up the marketing to get the name out. Mainly word of mouth and Google adwords at the moment. I have started a snail mail campaign - but this is in it's early days. Marketing the system is the next big step I need to take to make the venture viable. mechanisms/tools are in place to monitor the progress? Retention rate of users. Although the current numbers are small, those that have paid are loyal users, and the system has become a essential part of their workflow. There are a number of players in this market, the biggest is Harvest. There are some other small sites, such as Togglr, Clicktime and Punchytime, although they all use slightly different ways of tracking. 88 Miles is relatively unique in that is focuses on time clocks, rather than updating time sheets after the fact. Yes - all of the tools are Open Source. Many of the Perth based users are Australian Web Industry Association (AWIA) members, so I will see them at AWIA meet ups. If I am interstate, I will try to catch-up with other users if possible. I consider 88 Miles in the SaaS space, which is going to get huge. I think a lot of companies are realising the benefits of hosted services. This is especially relevant to small business owners how need reliable systems but can't afford the upfront capital hit, and to road warriors how don't want the hassle of syncing data between users. Build your system for yourself - that way you will get a feel for what does and doesn't work. You can't expect to build an awesome system if you are a heavy user. Thanks Myles for sharing your thoughts. 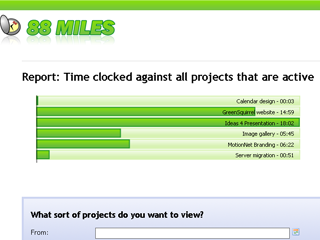 We look forward to hear from you in future on the progress of 88 Miles. All the best for 88Miles and the competition in this carnival.